The title for this small post sounds like a huge configuration, but it’s not. It’s just one setting. In this post I will show how to change it and, maybe more important, what it does. 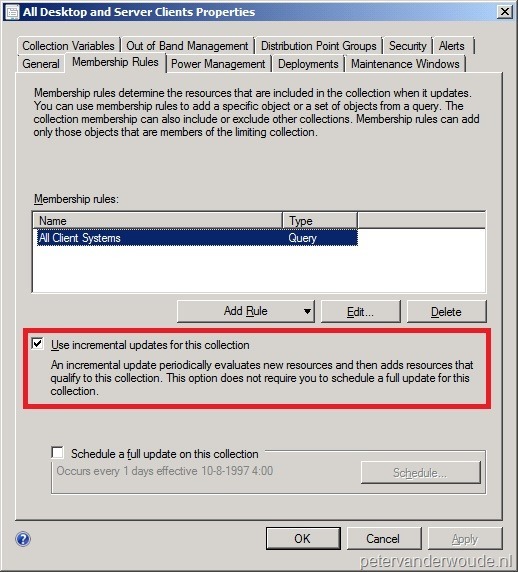 In ConfigMgr 2012 every collection has a checkbox Use incremental updates for this collection. This option is to periodically scan for only new or changed resources from the previous collection evaluation and update the collection membership with only these resources. This is what in ConfigMgr 2007 R3 was called Dynamically add new resources. The biggest difference is that now the interval can be configured. To configure the interval navigate to Administration > Overview > Site Configuration > Sites. Now select the Site and click Settings > Configure Site Components > Collection Membership Evaluation. The Collection Membership Evaluation Component Properties popup will show. Here the interval can be configured. Notice that the default value is, just like the delta discoveries on the Active Directory, 5 minutes. In general there is no use in running the Collection Membership Evaluation more often then the delta discoveries on the Active Directory. As a collection membership is mostly based on a membership and/ or existence in the Active Directory. Now after a change of the interval to, for example, 2 minutes, there is an easy way to check and see if the change got applied. This easy way is to look at the colleval.log. In this case, before the change the Incremental Cycle is triggered every 5 minutes (default). And in this case, after the change the Incremental Cycle is triggered every 2 minutes. Does the 200 max best practice limit change at all if we increase the evaluation interval? So for example, if we increase the interval from the default 5 minutes to, say, 30 minutes, would that not be less taxing on the DB and therefore allow a greater number of incremental collections? MS doesn’t say this, so I am thinking I am wrong, but would appreciate your opinion. That’s exactly why it’s “only” a generic best practice. 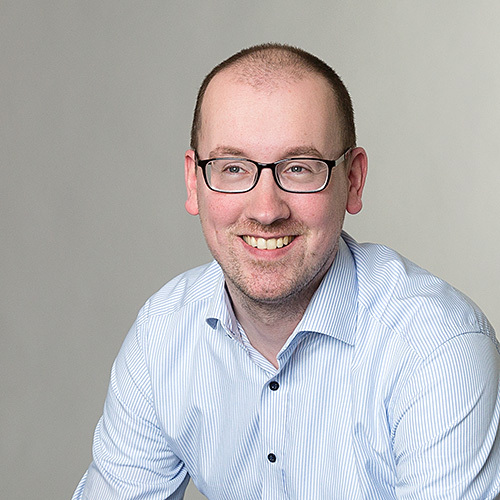 The main reason for that best practice is indeed the pressure on the database and the performance. If the incremental evaluation is not that often anymore, it indeed gives you more room for more collections. The main point I want to make is that it all depends on the performance. As it differs per environment, it simply means three things: test, test and test. Yes, I suppose a hard and fast rule is impossible given the near infinite possible configmrg setups in the world! Thanks for the quick response, much appreciated.